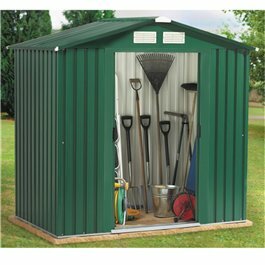 Metal Shed - BillyOh ANSTON 6' fronted Premium Steel Metal Shed . Our ANSTON all steel metal shed , apex roof shed is the answer where garden space is limited, or on the caravan park where non-combustible sheds are mandatory. The deep roll formed wall and roof panels provide MUCH IMPROVED STRENGTH when compared to shallow formed cladding of other steel metal sheds .